It’s Valentine’s Day – Treat Your Bae! It’s one week until Valentine’s Day and if you haven’t made plans already, it’s high time to kick it into gear. There won’t be any space left if you wait until the last minute to make reservations, buy your gifts and make the day (or the week!) special. You certainly want to impress your sweetie on this day of undying devotion so make your choices wisely. We’ve compiled a list of some things that you may not want to forget this Valentine’s Day. Floral Arrangements or a Bouquet – Whether its your first date or you’ve been together for years, flowers will make anyone’s day. They brighten up the mood, and can be custom tailored to suit anyone’s tastes. 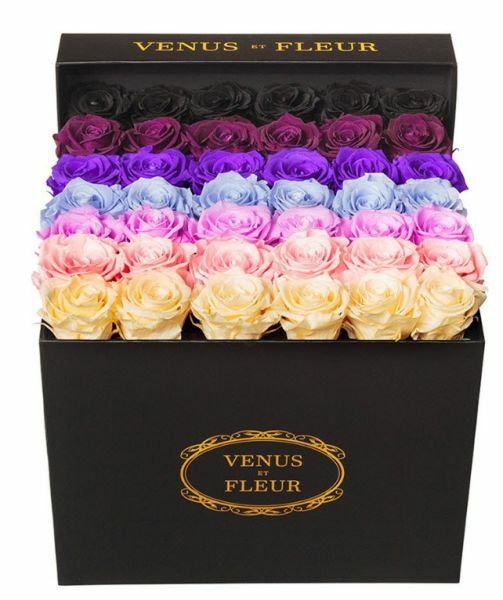 If you’re looking to make a lasting statement, order from Venus et Fleur for a box of flowers that will last for an entire year! Some may enjoy a simple long-stem rose, others may spring for an over the top display in a large vase, but whatever you decide to do, #makeprettychoices and it will be remembered for years to come. Something Bubbly or Sparkling – Pop the champagne you’ve been saving for a special occasion! Act like a teenager and visit The Sugar Factory for a giant sweet bowl of alcohol, or try your hand at mixology. Find a local venue that serves molecular mixology or order your own kit at to make them at home and surprise your special someone. Or you could always order the same drinks as you always do, but switch with your sweetie! New adventures are the spice of life. Delicious Reservations – Try something out of the ordinary, attempt a home-cooked meal if you always go out to eat, hire a personal chef for the night if you always cook, or look beyond your regular restaurant choices to something outside your comfort zone. Dirt Candy, an upscale vegetarian restaurant downtown, is a favorite of mine and I’m not a herbivore. Bold choices lead to even bolder results and Valentine’s Day is the perfect excuse to try a new cuisine or cooking style. Special Treats for Dessert – If you’re feeling adventurous, try your hand at baking a molten lava red velvet cake for this Valentine’s. It can resemble how your heart beats strong for your honey and pack a punch with its bright color. Or for something a bit darker, pick-up some delicious dark chocolate to put your sweetie in the mood. It’s proven to be great for the body, in moderation of course, and isn’t as sweet as the milk chocolate variety. Gifts to Make them Giddy – These gifts could be anything from the exotic and dark to decadent and indulgent, whatever best suits your mood. If your honey likes to indulge in natural cosmetics and cleansers, try Lush. Known for their range of bubble bath bombs, and colorful assortment of products – they’re sure to make a splash. Lush associates will help you hand pick a fragrance from their assortment of options, or if you don’t know what to get, then choose from their pre-packaged selections that are already gift-wrapped for you. Surprises are Always Nice – It’s never a bad idea to think hard about what your honey really wants, what they are always talking about or hinting at, and surprise them with their perfect evening. I recommend a tour of your first dates, a scavenger hunt that treks through your favorite places or a new experience. If you’re looking for a new romantic gesture, take your beloved on a romantic horse and carriage ride through Central Park, or try your hand at a private daytime horseback ride. Central Park Sightseeing offers both of theses options for a surprise gesture. Whatever you decide to choose for your romantic evening on Valentine’s Day, don’t forget to include at least some of the above. As much as your sweetie truly loves you, they still want to be put on a pedestal and treated like the King or Queen they are every once in a while. Valentine’s Day is a great excuse for it, but you should make every day of the year count, even if that means just whispering sweet nothings in their ear.